Eric visited us here at The Veterinary Referral Centre to see one of our mobile clinicians Elise Robertson. Eric had chronic nasal discharge and right sided epistaxis (nose bleeds). A nasal mass was suspected; visible in the lower of the three images. 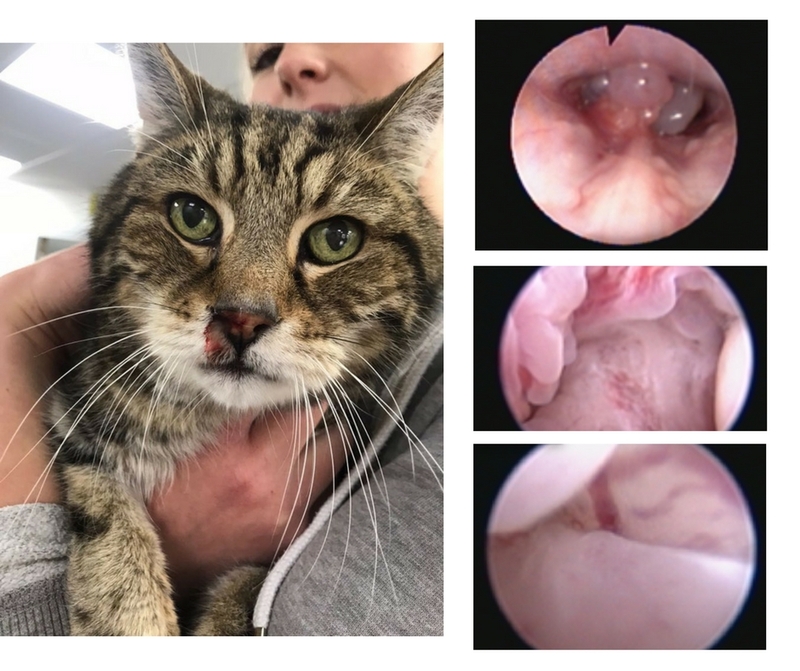 This handsome gent was kindly rescued by Croydon Animal Samaritans, but quickly won the hearts of Elise and our team.Elise anaesathised Eric and performed a Rhinoscopy to examine his nasal cavity. Rhinoscopy would provide us with both diagnostic samples and also access to saline flush and tissue debridement to provide therapeutic relief. the tumor was located and derided successfully. Upon his 4 week check, Eric has made a complete recovery with no signs of stertor, nasal discharge or obstructive dyspnoea! Is There A Missing Rib?